Actor Yoo Ah In (유아인) was first seen wearing a red-navy printed top from Prada Spring/Summer 2012 menswear collection to the press conference of 'Fashion King (패션왕)' held on March 14, 2012. Accessorizing his look with an outerwear and navy pants from the same collection. Unfortunately, the outerwear covered up the gorgeous prints. 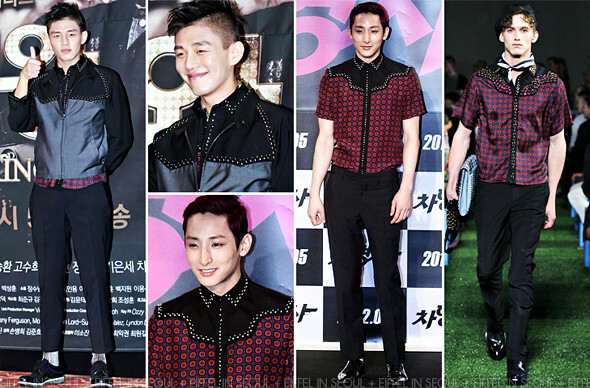 Actor and model, Lee Soo Hyuk (이수혁) was also seen in the same printed top at the press conference of 'Runway Cop (차형사)' held on March 3, 2012. Styling his outfit similar to the runway with the same pair of pants and patent brogues. Tough call. Both of them are going for different styles which suits their personality. I'll leave the decision to you.